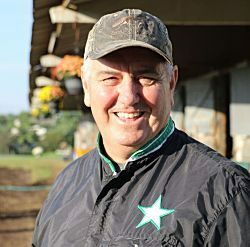 Hightstown, NJ — At the end of this season, Noel Daley will return to his native Australia to begin a new chapter in his career as the trainer for prominent owners Maria and Emilio Rosati at the couple’s new facility near Sydney. On Saturday night, Daley-trained Caviart Ally will try to deliver an appropriate going-away gift — a Breeders Crown trophy. Daley, who started his own stable in the U.S. in 1998, has already won eight Breeders Crown finals in his career, including three with pacer My Little Dragon and two with trotter Mr Muscleman. Milton Stakes winner Caviart Ally will start from post nine in the $270,000 Breeders Crown Mare Pace. New Image Media photo. Caviart Ally will start from post nine in the $270,000 Breeders Crown Mare Pace at The Downs at Mohegan Sun Pocono. The Caviart Farms-owned 4-year-old is 8-1 on the morning line with Andy McCarthy in the sulky. She finished third in her Breeders Crown elimination last weekend, won by Shartin N, but has hit the board in seven consecutive starts, including a win in the Milton Stakes, and earned $1.06 million lifetime. “We didn’t get the best post in the world, but she’s still capable of winning it,” Daley said. “It just depends whether she’s having a good day. She wasn’t very good (in her elimination), I don’t know if it was the track or whatever, but she came out of it all right. Caviart Ally is Daley’s only Breeders Crown finalist, but not the only finalist to which he has a connection. In the 2-year-old filly trot, favorites Woodside Charm and When Dovescry both are out of mares that were trained by Daley. When Dovescry is the first foal out of Cedar Dove, who won a Breeders Crown for Daley in 2011, and Woodside Charm is out of Fireworks Hanover and a half-sister to Daley’s millionaire Explosive Matter. Plunge Blue Chip, one of the contenders in the 3-year-old filly trot, is from the family of Mr Muscleman. Noel Daley will return to his native Australia to begin a new chapter in his career. USTA/Mark Hall photo. “It’s fun to see,” Daley said. In his career, Daley’s horses have earned $61.1 million in purses, which ranks sixth among all trainers in harness racing history, and his 2,564 wins rank 20th. Daley worked eight years for trainer Brett Pelling before launching his own stable and credits the relationship he forged with owner Adam Victor and his son Adam Jr. in the late 1990s as a springboard to success. Four of Daley’s five Breeders Crown-winning horses — My Little Dragon, Mr Muscleman, Cedar Dove, and All Speed Hanover — were owned in whole or part by the Victors. In addition to his success in the Breeders Crown, Daley enjoyed winning the Hambletonian with Broad Bahn in 2011. Still, nothing equaled the feeling of racing Mr Muscleman, who was a three-time Dan Patch Award winner, including Trotter of the Year in 2005, and was inducted into the Hall of Fame in 2017. Since 2009, the gelding has resided in the Kentucky Horse Park’s Hall of Champions. “Muscleman is still the best horse I ever had,” Daley said. “He was my highlight. Obviously winning the Hambo with Broad Bahn was special, but Broad Bahn was a long way from being the best horse. He was the right horse at the right time. Everything went right for him that year. That’s what you need to win one of those races. How good was he? It goes beyond his two Breeders Crown titles, two Maple Leaf Trot triumphs, and wins in the Kentucky Futurity, Canadian Trotting Classic, Titan Cup, and Cutler Memorial, to mention a few. Now a much more experienced Daley is ready for a new adventure and challenge. He has talked for years about returning to Australia, but now the time seems right. “All my family is there and I’ve been looking to do it for a while,” Daley said. “America has been good to me. I have no regrets. I never imagined I would be here this long and I always wanted to go home, it was just a matter of finding a way of going home where I could still make a living. And regardless of the outcome of Saturday’s Breeders Crown, he will leave satisfied.